Siem Reap is a small yet rapidly expanding town in north-eastern Cambodia. Visitors from all over the world use it as a point of departure for exploring the ancient city of Angkor — whose temples are considered architectural gems in Southeast Asia. As Cambodia struggles to emerge from economic ruin and shed its reputation as a dangerous war-torn country, these magnificent temples provide a much needed opportunity to reap tourist dollars, thus contributing to the development of the nation. However, after spending only a week traveling in northern Cambodia, I learned there was much more to see — especially Tonle Sap, the largest freshwater lake in Southeast Asia. We had spent three full days exploring the temples at Angkor, and decided to take a day off and try something different. Our driver offered to take us outside of Siem Reap where we would be able to make our way to Tonle Sap (Great Lake) whose tributaries form a precious lifeline for Cambodia’s largely agrarian and fishing-based society. The lake drains into the Mekong River via the Tonle Sap River and a series of smaller streams near Cambodia’s capital of Phnom Penh. During the dry season the lake covers 2850 square kilometres; however with the coming of the flood season from April to October, the powerful Mekong River reverses its direction, flowing north back into Tonle Sap. This unique natural phenomenon creates a massive reservoir, increasing the lake’s depth by nine metres, while tripling its size. Approximately 6000 square kilometres of forest surrounding the lake are flooded, creating an extensive and protected breeding ground for over 300 species of fish. The floods also control agricultural production in the area by leaving a highly fertile silt base on the land for the cultivation of rice. Thousands of farmers, fishermen and their families have been supported for centuries by this amazing natural phenomenon, as you can see depicted in the incredible thousand-year-old bas-reliefs on the walls of the ancient Angkor temples. 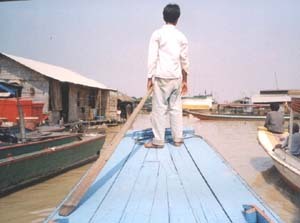 Although we were there during the dry season, our driver explained that we should visit Tonle Sap because it is also the site of another unique phenomenon — a floating village. 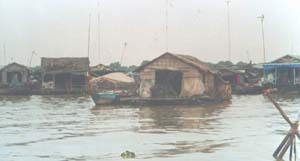 Hundreds of people live in floating houses, and many others are built on wooden stilts off the banks of the lake to protect them from the floods. These are the homes of rice farmers and fishermen who settled with their families around the lake and wait each year for the floods to feed them. The village and lake are secondary local attractions for those visiting Angkor, and are reached by longboat down one of the many small rivers feeding off the lake. For a small fee we arranged to visit the village in the afternoon after spending the morning visiting Angkor Wat a second time. On either side of the red-dirt road that leaves Siem Reap and leads into the countryside were emerald-green rice paddies surrounded by the last few puddles of mud-clouded water. Our driver took us to a roadside checkpoint where we paid the fee for the private motorized that later would take us downriver. From the checkpoint, we proceeded down a path that became increasingly rough and uneven. 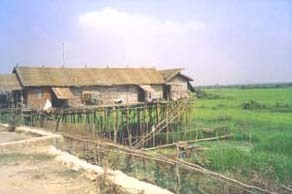 From the path we could see grass shacks with wooden floors supported by stilts and standing over the rice fields. Each was linked by a thin wooden bridge to the roadside. People began to appear up ahead walking along the road carrying empty baskets. The flow of traffic gradually increased red dust began to rise from the narrow dirt road. Small children ran by, laughing and chasing each other through the clouds of dust. Several of them were naked and splashed through the mud puddles. The grass huts had open doors — many actually had no walls — revealing men and women lying on thin mats or in tattered hammocks. In this way they were sheltered from the sweltering sun and were avoiding any movement that would increase the dehydrating effect of the dry heat. These were the farmers who have hardly a free moment during the harvest season, but are unemployed during the dry season. Those we observed — like the land — were thirsty for the rains. Some of these families drift into the cities during the dry season in an attempt to find work selling souvenirs or cold drinks on the side of the road, or working in the tourist guesthouses and hotels. Others simply wait it out. Lying motionless in the heat and swamped by flies, they watch their children playing in piles of garbage. As the path approached the river, the filth, flies, and stench of rotting material increased. I noticed some other tourists getting off a boat that had just returned from the lake. They were holding handkerchiefs over their mouths and looking appalled; one of them was actually gagging as the group wandered around. They were thankful to find their air-conditioned tour bus among the crowd of vehicles and people assembled near the boat launch. For us as well, it was a smell and a scene we had never experienced before. To understand what we observed, imagine the scenes of human degradation and deprivation that are so frequently depicted on television news and current affairs shows. What we were observing, however, were not television images; this smell of desperation could not be erased by changing the channel. As a result of the distress I felt, the thought occurred to me that everyone who lives in a developed country should experience such a scene at least once in their lives. The experience also made me think about what I had waiting for me back home in Canada. 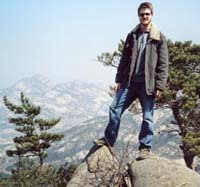 Ironically, it also made me think about why I had left Canada to travel around the world. I wanted to experience other realities, even if it meant encountering situations many would prefer to avoid. What I was seeing here made everything I worried about at home seem trivial. (I have been told that this is a common reaction of first-time visitors to developing nations in which scenes of extreme poverty are common.) What we were seeing close-up was the immediate and painful reality of a much larger society struggling to catch up. Such travel experiences are disturbing of course, but for us it was a valuable lesson. Our driver then led us to our wooden longboat. The boatmen were two boys: one operated the motor and the other stood at the bow with a long oar that he used to push our boat through the other boats passing by. Both boys were barely into their teens but their faces had a wise-beyond-their-years look — aged by the sun. They smiled politely and offered us comfortable seats; and a life jacket if we wanted it. The boys slowly began to manoeuver the boat out into the river away from the other boats and drivers sitting around waiting for fares. Before clearing the docking area, however, we stopped briefly. The boys pulled the motor out of the water and eased over to the riverbank, apparently allowing someone to pass. I turned around to see a wooden and grass-woven house being towed behind a small motorboat. Some young men were in the water up to their armpits on both sides of the house, guiding it down the river. At the front and up to his chin in water was an older man, presumably the father. He was supporting the front edge of the house on his shoulders, guiding it along. At the rear of the house two more wooden canoes were being towed. One carried three small children while the other carried two women, who I assumed were their mother and grandmother. It was moving day and the family was taking their entire lives, home included, downriver to the lake where they would anchor and wait for the annual flooding that would allow them to resume their lives. As we left the congestion of water-borne traffic behind, the river began to twist and turn. The banks were often hidden by tall reeds in which old wire cages and ruined boats were marooned. We came upon a few fishermen untangling nets in their small wooden boats. One middle-aged man, shirtless and with sunburnt leathery skin, stood waist deep by the riverbank holding up his net. He was engaged in the traditional form of fishing the Cambodian people have been using for centuries. He stepped lightly through the water toward a marshy area, and then with a sudden and very practised motion he launched his net which was carefully weighted with two small rocks. The net flew gracefully over the surface of the water and then with a light splash disappeared quickly to the bottom. The man carefully began to collect his net, trying not to leave any opening for the fish to escape. This centuries-old delicate procedure was the embodiment of life on the river. Our boat had already moved around a bend in the river and I could not tell if he had caught anything. As we neared the lake, the river widened, opening up to a vast expanse of muddy caramel-colored water with dark ripples. Merging with the lake we were quickly surrounded by floating wood-framed houses with thatched grass roofs. A few of the structures had rusted metal siding and many had slanted metal antennas sticking up at odd angles. A particular floating structure stood out prominently; it was painted yellow and green and much larger than the others. It was also longer than the others and had a series of open windows. Inside, children in white shirts and blue shorts were busy working at their desks. Looking out the other side of the boat I saw two canoes passing. 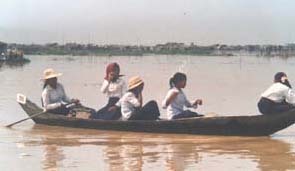 In each were three young, smiling girls, dressed in the same white and blue uniforms, on their way to school by canoe. The longboat took us down the main canal of the village; dozens of floating buildings were clustered together. Some of them looked shabby and desolate, but many of them were attractively decorated with brightly coloured paint of various shades. Flower pots in bloom added even more decoration. We even passed a small vegetable garden on a floating platform. One of the newer looking buildings had a sign that read “Police Station.” There was a floating hospital nearby and even what appeared to be a floating machinist shop where two men were welding and another worked on a boat engine. We could hear the hum of fuel-operated engines suggesting power generators.We also noticed an attractive yellow and blue A-frame building with a blue wooden cross; the local floating Catholic Church. Around one corner we came upon the General Store; next to it was a floating vegetable market of boats tied to the dock. Customers were coming and going in canoes, longboats, and a few larger fishing boats. Our boatmen then took us farther out into the lake to visit a floating two-story market complete with a restaurant, bar, and rare fish museum exhibiting examples of the hundreds of different species of fish which inhabit the lake during flood season. We also saw a dozen or so alligators in a large tank. The time we spent touring the floating village of Tonle Sap was also a lesson in human resourcefulness. For centuries this Cambodian lake has been a vital source of life for the local people; fertilizing their crops and filling their nets. And in recent tragic history — when the land was too expensive or malignant with landmines — the people of Tonle Sap returned to living on the lake. 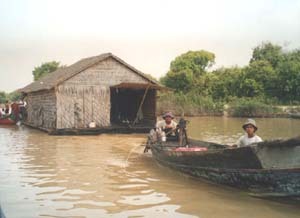 Tonle Sap is considered one of the world's geographical wonders as well as a unique area that sustains an equally unique way of life. For additional information, visit the websites below.